Hi everyone! If you're a regular reader of my blog, you'll know I suffer with my skin. I have tried numerous lotions and potions, routines and spot treatments, but nothing has completely cleared up my skin. Therefore, I am creating a new series on my blog called Banishing the Blemishes. I am currently trying out products from some lovely companies in the hope of returning my skin to its post-blemish state. The first in the series is Skinetica. Anti-blemish Skinetica is a colourless liquid for spots and blemishes, that claims to clear the skin quickly and kindly. What's more, Skinetica contains no harsh chemicals, is non-greasy, and works best applied directly to the skin twice a day with a cotton pad. I was extremely excited to try Skinetica as I have seen so many rave reviews about it from other bloggers. When my Skinetica arrived, my skin had (conveniently) broken out in a cluster of 5/6 spots, which were perfect to trial the product on. They were quite red, sore and inflammed, so I was pleased to find when applied, it didn't sting at all. I applied it twice a day religiously and within a couple of days, the spots were all but a distant memory. Perfect! I did notice however, that the area of application was left quite dry. I presume this is down to the alcohol in the product, as I find it dries my skin out. I found Skinetica works best on whiteheads, as opposed to "under-the-skin" spots. When I applied to said spots, it didn't really make a difference, just dried out the surrounding area. 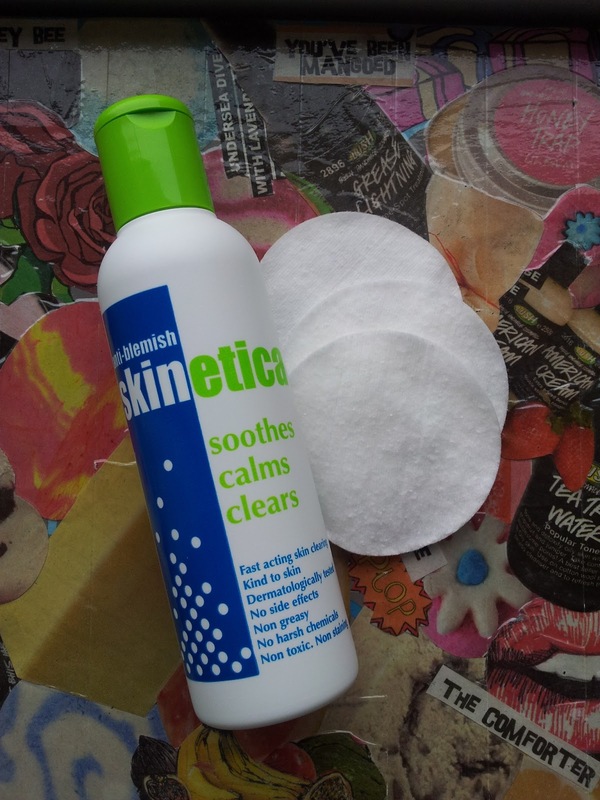 Overall, I would really recommend you to try Skinetica if you suffer from whiteheads, as it is definitley very effective, albeit a little drying, for clearing them. In my experience, whiteheads cleared within two days, and didn't leave a horrible red mark behind - horaaah! If you'd like to give Skinetica a go for yourself, you can order a free sample via their website and contribute just £1 towards postage! Alternatively, full size bottles are available for just £9.99 including postage, which is great considering the great effects it has! Thanks for reading, look out for part 2 of my Banishing the Blemishes series! I was sent this to review but I haven't had a break out yet. I usually get atleast one break out a month & because I have such pale skin the redness is a nightmare to cover so I can't wait to give this a go and see if it works. This sounds like an amazing product, but I have really dry skin, specially now in the winter time. it's rediculous.